LAURA SIMNA brings a much-needed measure of dignity, professionalism and completeness to The Minimum Requirements as the band's lead violinist. She joined TMR in July 2007 after guesting on numerous live show and collaborating with the band on the recording of Watch This. Laura was born and raised in Cleveland, Ohio, the daughter of two classical musicians. From a young age Laura accompanied her parents to their concerts, often sitting amongst the orchestra for the rehearsals. Before she turned three, Laura decided she would one day be a professional musician. At age three she began studying the violin, and soon performed her first violin recital, a rousing rendition of "Twinkle Twinkle Little Star." In kindergarten, Laura also began studying the piano. Throughout grade school and high school Laura studied at the Cleveland Music School Settlement and the Cleveland Institute of Music. During this time she performed with numerous orchestras including the Cleveland Orchestra Youth Orchestra, chamber ensembles, and as a soloist. She attended many music programs including the Weathersfield Music Festival and the Boston University Tanglewood Institute. 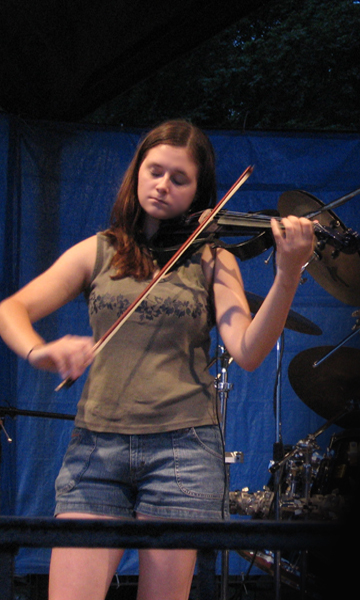 In 2001 Laura performed across Europe with a group of music students from all over the country. She also spent time in high school studying vocal performance. During her senior year of high school, Laura became interested in jazz and blues and began exploring non-traditional violin music. For graduation Laura recieved a blue electric violin, which she often busts out at TMR shows. Laura first met The Minimum Requirements in the fall of 2003. Even though she had been in COYO with Justus for 2 years, they didn't actually meet until Laura ended up in Justus' music theory class at CWRU. The class received an assignment to work in pairs and write a song. Justus wrote their song while Laura sat and watched. Impressed with his ability to do her homework, she thought "I must hang out with him more often." Laura began working at Justus' music store, where she took guitar lessons from Danny. The lessons quickly degenerated into jam sessions with Laura on violin and Danny on guitar. Danny wote violin parts for some TMR songs and invited Laura to sit in on a show. After a year as a guest artist, TMR decided to keep her. Laura received a B.S. in Music from Case Western Reserve University, where she studied violin performance and music theory. While there she also studied Eurhythmics and is currently working towards a Dalcroze Eurhythmics Certificate from Carnegie Mellon University. In the fall, Laura will begin two Masters programs at The Ohio State University, an M.A. in String Pedagogy and an M.M. in Violin Performance.